Inhumanity? Insanity? What would you call this? – A Silent Self Wave.. I saw her on a bed in the hospital. She was all alone, no relatives no friends nearby. Only tears in eyes and a 1-day old baby next to her. Her face showed her helplessness, her disappointment, her anger, probably her urge to end this life. I wondered what would have happened to her? 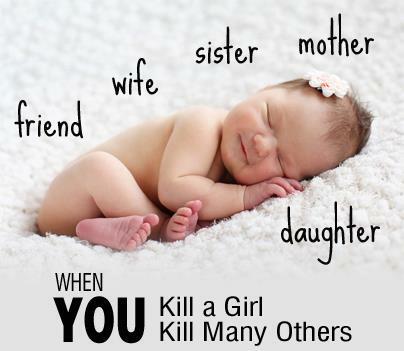 For every woman, the day when she gives birth to baby is the most special day of her life. The happiness cannot be compared to anything else in this world. Then why is this lady so depressed? I didn’t know if it was fine to go and ask her directly. I was in the hospital for my regular check-up when I had a glimpse of her. Do I have any rights to interfere in others personal space? I know how a would-be mother and a new mother feel about the baby. I am counting days myself. Then what’s wrong with her? My mind couldn’t get her out of my thoughts. These questions kept poking me. Should I go and talk to her? Are my words going to break her more? Or should I simply hold on my silence? Probably god understood my dilemma. So he sent a nurse in her room to give her medicines. I got my way. When the nurse came out, I took courage to ask what’s happening. I was shocked to hear the truth. This lady had given birth to a baby girl and so all her family members including her husband were upset and didn’t bother to be with her in this situation. I can’t believe this still happens in India? Not in rural place but in a city like Pune, in a hospital like this which only a middle class and above can afford, not with illiterate people but with people who look so well educated? For a moment, I couldn’t digest this fact. No, come on this can’t really happen. I saw her again, and her baby as well. The baby was no less than a cute little princess. Any stranger will fall in love with such an innocent tiny-tot, then how can her father and family hate her so much? What’s her mistake if she is a girl? In these months, I have seen so many couples in the hospital who are praying hard to god and spending thousands and thousands to have a baby of their own. And when their treatment fails, I have seen their hearts broken through their eyes. They wait for years and years for this happiness. And look at this family; they don’t even care about the just born? Can people be so inhuman? For a moment, our education system, our awareness campaigns, our society – everything looked meaningless. Where are we heading really? I glanced back at my own life. Are there any drops of this acid in my life? Unfortunately, the answer my heart gave was “YES”. Post marriage, whenever I have visited temples, whenever I have taken blessing of elders – specially elderly women – they have all blessed me to “HAVE A SON”. I have been ignoring this fact, thinking they are from older generation. But today I feel, are these the people who are making India like this? Isn’t it ironic for a woman to bless another woman to have a boy not a girl? We are two sisters to my parents. I mean “NO SON” to my parents. I thank them to give us this life. Imagine if they were like this family, we wouldn’t have been in existence even. I remember my relatives asking – “Oh you don’t have a son?” Then trying to sympathize with my parents. When I got married, people teased my parents that “one daughter is leaving you and second one would go soon, wish you had a son to take care of you in old days”. I wondered since then, why can’t I take care of them in their old age? My mom dad are strong. I have never seen them feeling low that they don’t have son. They have been boldly answering that they don’t need a son, their world is complete with their daughters. I am proud to say that me and my sister have done nothing less to my parents that a son would have done. I always thought that if I can be a daughter and not a daughter in law to my husband’s family, my husband can also be a son to my parents. And I was proved right all the time since I am married. I don’t have any restrictions to take care of my parents. Why should I have even? Are parents a responsibility of son only? If my experience of being a girl is good, then why are women facing this problem still? Will a baby be hated just because she is a girl? Will she be taken as a burden lifelong without her mistake? This 1-day old baby doesn’t even know what a girl and a boy is. Are we living in a society that can be called “well-educated”and “modern”? So hard to believe such injustice. . . . Very touching post. It addresses the major issue which needs to be dealt with in an effective way. Hi Aparna, I loved your post and would be visiting to read more of your posts. Very inspirational and beautiful blog you have. Happy blogging. See you soon and take care.